Adoniram son of Abda (was) in charge of forced labor. Many people have told me over the years that they struggle to read the Old Testament because its ‘s boring. A chapter like the one today is probably a good example. Compared to the buttery, heart-felt lyrics of David’s Psalms, today’s chapter is dry toast. 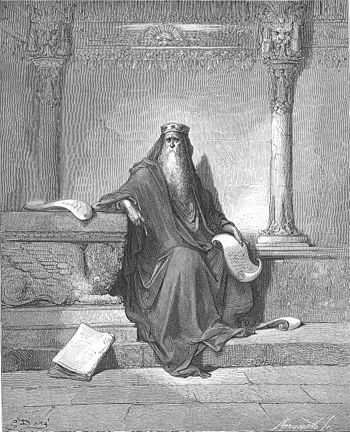 The book of Kings was written as a historical record of Solomon’s reign. As such, it records of the names of his officials. But seriously, who really cares today who served as Solomon’s cook? As I’ve read through these books over the years, I’ve learned to approach chapters like today’s with a certain frame of mind. You have to look for small details, repeated patterns, and names that are familiar. Sometimes these nuggets, when you put them together, become clues to a broader understanding of the context. The description of Solomon’s kingdom is notably large and lucrative, especially compared to what his father David started with, and what the first king, Saul, had before David. Conclusion: David’s conquests were paying off, and Solomon was raking it in. Two of the 12 governors were sons-in-law, married to Solomon’s wives. Conclusion: A little nepotism has taken hold in the monarchy. History teaches us that political nepotism usually breeds favoritism, conspiracy, racketeering, poor management, and scandal. I’m seeing a tragic flaw emerging in Solomon’s wisdom. David and Solomon were both noted for building their palaces and building the Temple, but I noticed that Adoniram is providing them with forced labor or slave labor (Adoniram’s has been at it a while, his name came up in 2 Samuel 20:24). Conclusion: Eventually forced labor, especially the forced labor of your own people, leads to civil unrest. Taxation, nepotism, and slave labor. [Scratching my head, carefully avoiding the receding hairline] If I’m standing in Solomon’s sandals things seem pretty cushy. If I’m standing in the sandals of a common citizen on the outskirts of Gilead who just watched the king’s official walk off with my children, my livestock, and a two month’s supply of olive oil, I’m not exactly feeling the love. I feel a storm cloud rising on the horizon. Today, I’m thinking about how we sometimes don’t see the forest for the trees. This happens in families. This happens in business. This happens in churches. This happens in government. I’m thinking about broader implications of words, decisions, and actions. I’m praying for discernment to see the bigger picture around me, and for courage to make tough choices based on what I see and perceive.